I'll be away for a short time. Unfortunately, I won't be putting any new posts or cards up probably until next Monday. My brother passed away and I'm going to Ottawa to be with my siblings for the funeral. It's been a difficult last few days and I'm looking forward to seeing other members of the family and remembering the life of George. See you soon and thank you all for taking the time to read my blog. Ever had one of those days! That's what it says on the inside of this card. It's another image by Paper Pretties. I now have two of their stamps, but having joined the SOTM club, I'll soon have a wonderful collection. My first SOTM will arrive in July. I sure hope it's before we move. Well, Canada Post will re-direct it anyway, but it would be so much better to have it to pack up and take with me. This card is very simple. I started with PTI Select White and my Cuttlebug with the Swiss Dots folder. After scoring my card with the Scor-Pal, I placed the Swiss Dots folder so it was partially over the fold and ran it through the Cuttlebug. That means that a portion of the back of the card is also embossed, but I believe it just adds to the tactile element of the card. Then, I placed the CB folder over the right hand side of the card and ran it through again and, voila, embossing with a blank space in the middle. And, I did it without cutting the folder as I have read some people have done. 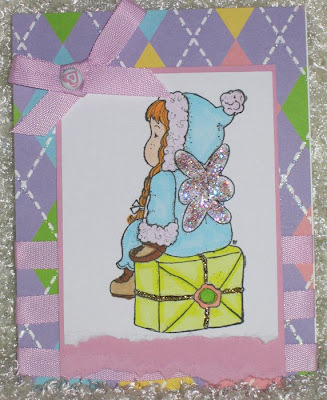 After the embossing, I stamped the image in the centre and coloured it with Copic Markers and added some dotted ribbon by PTI from the Summer Sunrise collection. The inside of the card simply says, "Ever had one of those days!" This is one of the many, many cute stamps you will find at Paper Pretties. Christie also has a Stamp of the Month club where all you get is the stamp. So many places out there, that are great, offer a lot of extras for a larger price. Paper Pretties is a no-nonsense SOTM. All you get is a stamp, and all you pay for is a stamp. Perfect in my opinion, at least. Check it out for yourself and see what you think. Okay, on to the card for the deets. The only thing new on this card is the stamp! I pulled out my green scraps folder and picked all of the papers from there. The base is SU, the pp is probably from Self-Addressed, there's a bit of dark green Bazill and a lighter green probably from the inexpensive packs you can get at Wal-Mart. The brads are from so long ago I don't remember who made them. Most likely there were a purchase from The Dollar Store. 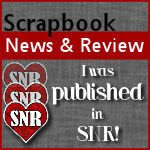 I think it turned out well enough for me to visit my different-colour scrap folders more often! I picked up another stamp from Paper Pretties, but I haven't made it into a card just yet. Later today, probably. "Y'all come back now, ya here." That just popped into my head and I know it's from a TV show, but darned if I can remember which one. Anyone out there who can tell me? Another adorable little boy to love! I have a feeling that my grandsons are going to get cards for no reason whatsoever because I'm in love with these images by Pink Cat Studio. I've got Dress Up Billy as well, but need to cut them up and mount them on EZ Mount and there's so many bits, it'll take me a while to get it done. This card has a Chocolate Chip base. The DP is from my stash and unknown by me, at least. The sentiment and star are Close To Cocoa. Billy was coloured with Copic Markers and his buckle and harness on the horse's face are coloured witht the gold Copic Spica pen. Stay tuned, who knows which Billy will show up next! The Billy stamps by Pink Cat Studio are just the coolest! 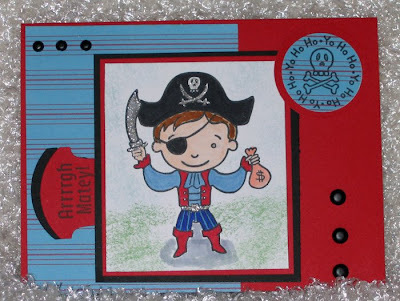 Here's my first card using the pirate Billy. The base is Real Red and the striped blue and red pp is from one of the Self-Addressed monthly kits, but I can remember which one, sorry. I finally remember to use some of the dozens of punches I have to embellish the card. I keep forgetting those darn things and they add so much to a card. I used the CM circle punch and the SU Round Tab punch. A few brads in opposite corners and it was complete. This will make a terrific birthday card for a special little boy who will soon be two years old, already! 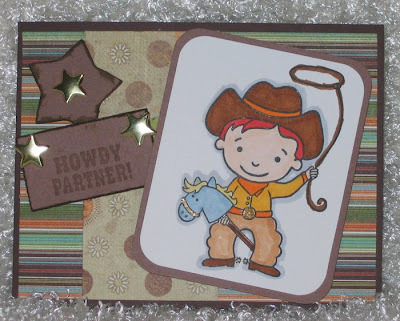 Both of these cards are using the "Many Happy Re-turns" stamp set designed by Rupa Shevde for Gina K. Designs. I love this set! Now, on to the challenges. "Thank you sew much!" was created for SC181 at SCS. 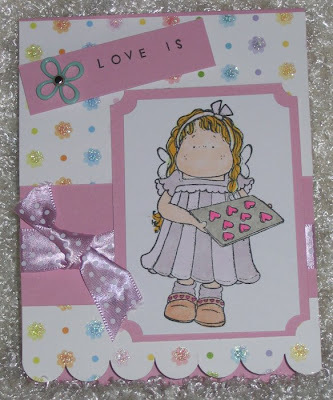 The card base is yellow, the DP is Ginger Blossom and the image was stamped onto Soft Sky. 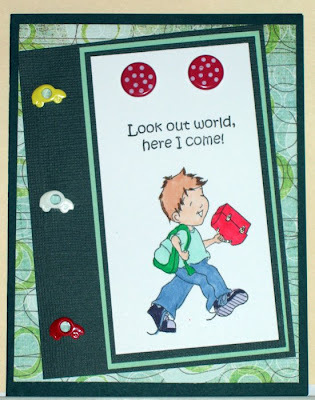 I stamped it with Versamark, then into Blue Bayou ink, sprinkled with clear embossing powder and heat set. The Soft Sky ribbon is attached with Blue Bayou brads and the thimble and dressmaker embellishments are from Buttons Galore. "Sorry for the mix-up!" incorporates two challenges in this card. This weeks colour challenge, CC171 and last week's sketch challenge, SC180. Just a quick post today as I've got to go out and do some grocery shopping, UGH! A friend sent me some Magnolia images to play with! Sue in England sent me a pile of adorable Magnolia images and I wanted to play right away. This is Tilda and she's just baked a plate of cookies, at least in my estimation. She was so much fun to colour and I used my Copic markers, of course. The card base is PTI Select White and I added a piece of Lavender Moon c/s. The scalloped edge was made using my SU slit punch and the DP is by DCWV Glitter Stack. 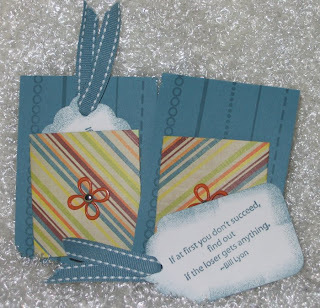 The sentiment was created using the alphabet stamp set by PTI known as Simple Alphabet. I added some Lavender Moon dotted ribbon and a flower from Buttons Galore and More. Here is Tilda sitting on a present. Once again, Papertrey Ink products are featured in the card base, the Lavender Moon twill ribbon, and the little bit of Lavender Moon which was use to mat the image. Copic Markers are the colouring medium I used, along with more DCWV Glitter Stack designer paper. I almost forgot, I used Lavender Stickles on the wings and Gold Stickles on the twine on the present. Here's Edwin with his broom. I hope he remembers how to use a broom when he's all growed up! 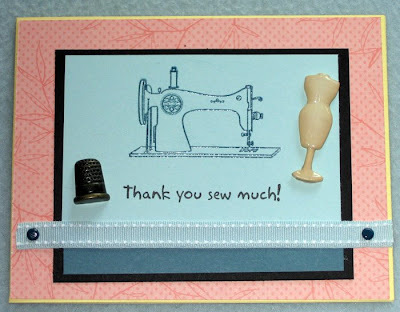 I began this card with Kraft c/s by SU. I stamped the Lovely As A Tree, using Versafine Sepia ink. I dabbed a bit of Kraft White ink to make it feel like winter. 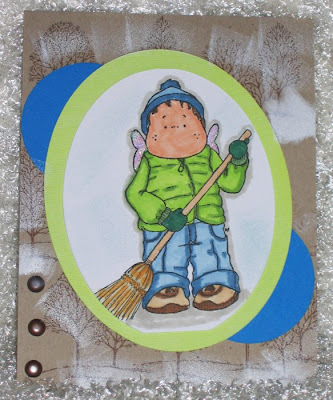 To colour Edwin, I used Koh-i-Noor woodless pencils from Gina K. Designs, and blended it with Gamsol and stumps. I really like the way the colour moves around so smoothly. I'm pretty sure these pencils with get plenty of use. Okay, that's it for this post. I'll be back tomorrow with a new card I made today but haven't photographed yet. I'll work on that later tonight and be ready for tomorrow. MOJO42 over at Poetic Artistry. 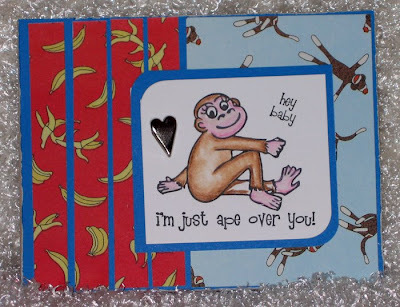 Besides being a really cool sketch this week (as always), I wanted to use the ape/monkey stamp designed by Melanie Muenchinger for Gina K. Designs. You want to know why? Well, I'll tell you. Melanie is giving away a a FREE set of her newest design during the Gina K. release party on June 20th. I just didn't want to miss another chance to win one of Melanie's sets. I love, love, love her designs. That's why I had to use this sweet little ape/monkey, why I had to enter the Mojo42 sketch challenge and why I'm telling you all now so you can try to win, too! Just upload your cards at SCS using keyword MMGKD1 so Melanie can find them and randomly select the winner (hopefully me!). Now for the deets on this card. The base is kraft c/s by SU. I adhered a piece of CTMH c/s from the Carnival collection. The DP is part of Daisy D's Pet collection. I stamped the ape/monkey (Melanie, can you clarify if this is an ape or a monkey so I can stop typing both, please?) onto PTI Select White, using Palette Hybrid Black ink. Then, I cooured it using the Koh-i-Noor Woodless Pencils which are available at Gina K. Designs. I blended it with Gamsol and the stumps. I added the little silver heart as an embellishment. I think I may give this card to my DH for our upcoming 12th anniversary on July 12. I'm pretty sure by then all my supplies will be packed away for moving so I wanted to get it done early. Pink and Orange! Those were the colours to use for CC10 at The Stamp Shack. The picture doesn't really do justice to the Ginger Blossom paper by SU. The pink really "pops" in real life, almost like a 3-D effect. The card base is Groovy Guava to which I attached the Ginger Blossom DP. 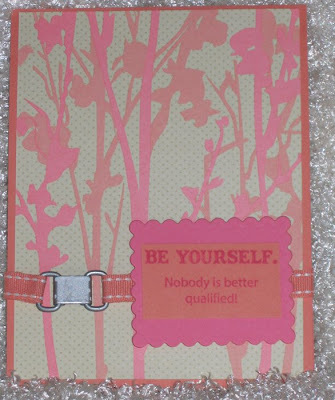 The sentiment is from SU's Smarty Pants set, stamped with Pixie Pink ink onto Groovy Guava c/s. I used the Nestabilities (which I usually forget) and cut and embossed a bit of Pixie Pink c/s with the small, scalloped rectangles. The ribbon slide is by Queen & Co. and it's holding some Groovy Guava ribbon. 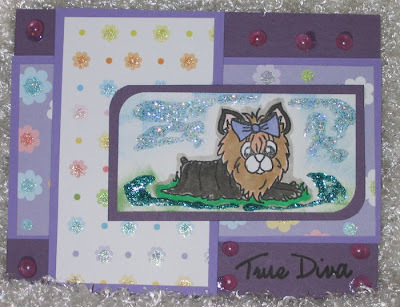 All DT members of the JessicaLynn Original Stamps were challenged by Amanda to create a card using SC166. 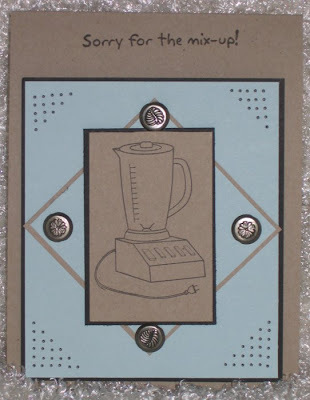 That was about two weeks ago and with getting ready for the garage sale and generally going crazy trying to remember and list all things "move related", I finally found myself with some time to sit down at my craft table and make this card. This little Yorkie IS a "Ture Diva". She's not from one of the newer releases, but she is a much-loved stamp, nonetheless. I used SU's Perfect Plum as the base and Lavender Lace for mounting the bits of glitter paper from DCWV Glitter Stack. The image was stamped on PTI Select White using Palette Hybrid Black ink, then coloured in with Copic Ciao markers. For glitz, and all True Divas NEED glitz, I used some Bella's Baubles and, of course, that old-glitz-standby, Stickles in Aqua and Arctic Ice. Some calm before the storm! I signed myself up for three ATC swaps over at The Stamp Shack. They are, in no particular order because I can't remember which pic shows up first, Sassy Stripes and Playful Polka Dots. Both of these swaps are being hosted by my good frient, Sherri a.k.a. iloveflipflops. They're not due until late August, but I'm getting them done now so I won't be late due to moving and stuff. 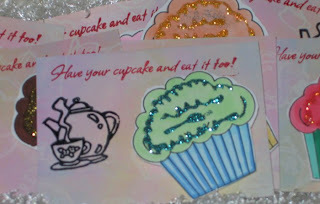 The middle picture is for the Tea and Cakes swap being hosted by another Shackie, Sue a.k.a. Artyfarty. Sue lives in England and I hope to meet her one day when I'm visiting my DD and grandsons. 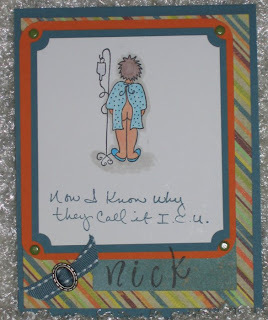 Last up is the card I made for our neighbour, Nick. He recently was hospitalized and spent a couple of days in the ICU and I thought that this stamp was very appropriate being as when his wife asked him if there was anything he needed, his response was, "yea, please bring me a pair of underwear". Honest, I didn't peek through the window at all! LOL! I'm happy to say that Nick is now back home and recuperating nicely. My DH will be glad to get outside and go visit Nick soon. Just looking at this card makes me happy. It came about in a rather unusual way, I must say. Because we're moving from Thunder Bay to Guelph in a couple of months, I decided I needed to clear out some stuff from our closets, stamping stuff included. I pulled out a bunch of stamps I don't use very often and offered them for sale in the Shack Marketplace at The Stamp Shack. I had about 12 or more SU sets and promised that some High Hopes and Pink Cat Studio sets would follow soon. Well, some of the SU sets sold quickly and then a couple of ladies asked about the other sets. I started to go through them and, well, I found I was unable to part with any more stamps, sets or otherwise. This came as a big shock to me as I guess I didn't fully understand my addiction to this craft. As I looked at each set, and I only got as far as the High Hopes, I found myself cringing at the thought of parting with the boy with the frog, this lovely little girl holding a stuffed heart, and, well, the baby blowing the bubbles; unthinkable to sell. Anyway, to make a long story short, I withdrew the balance of the stamps from Shack Marketplace and decided that my family will just have to bury me with all my stamps when it's my time to go to that Great Stamping Convention in the sky! 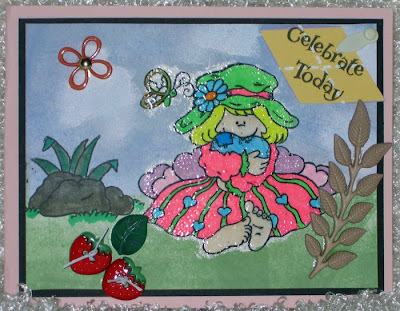 "Celebrate Today" was inspired by the cards created by Michelle Zindorf at Freedom In Creating. I love, love, love what she does with a brayer and regular cardstock. The effects Michelle achieves are remarkable and I wanted to see if I could even come close. While not as good as her cards, I am pleased with the way this one turned out. I stamped the image with Black Palette Hybrid ink and coloured it in with Copic Markers. Then, I used my finger to cover the entire, coloured image with VersaMark. I don't have a marker yet, but my friend, Erin K. picked one up and is sending it to me as a RAK; isn't that terrific of her? Thanks, again, Erin! 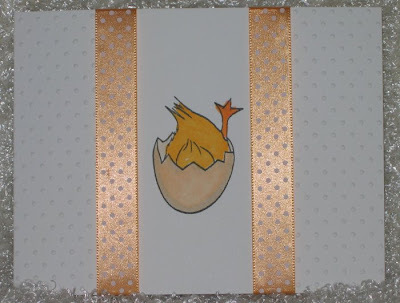 You can see Erin's blog and all of her great cards here. Then, I sprinkled clear embossing powder over the image and heated it up. I selected Soft Sky ink for the first layer of ink and using my brayer, went over the top portion of the card several times. Next, I added some Ballet Blue in in the sky as well. For the grassy portion, it was Wild Wasabi, making several passes with the brayer. When I was satisfied with the colours of the sky and grass, I stamped the rock with the leaves and coloured them using Copics. The embellishments are all from Buttons Galore. I like them because they have great selections of smooth-backed embellies just perfect for cardmaking. There you have it, Celebrate Today ~~ just because!